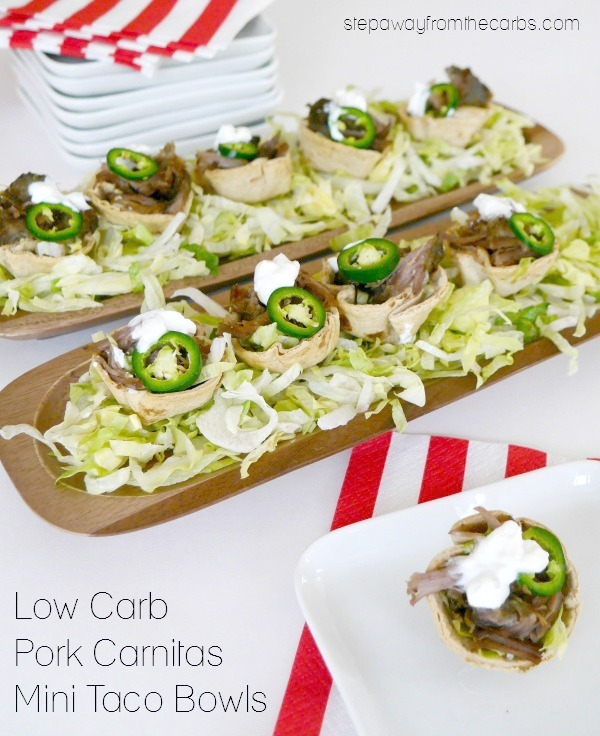 These low carb pork carnitas mini taco bowls are perfect for game day or party entertaining! We have some friends coming over to our house soon and I was in Walmart the other day looking for some food inspiration. 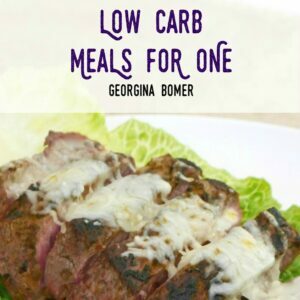 I’m always looking for low carb short-cuts, and I happened to see some Smithfield Marinated Boneless Pork Shoulder Seasoned Carnitas in the fresh pork aisle. 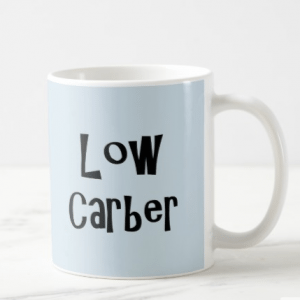 I’d not seen it before but it is a new product to Walmart and at only 1g net carb for 4 oz, I knew I just had to try it – it would be perfect for making one-bite mini taco bowls! It is 100% pork and is absolutely loaded with a flavorful marinade, making it a very convenient way to make a delicious meal! There is also a variety of flavors across other Smithfield® products including tenderloins, loin fillets and roasts – all available at Walmart. 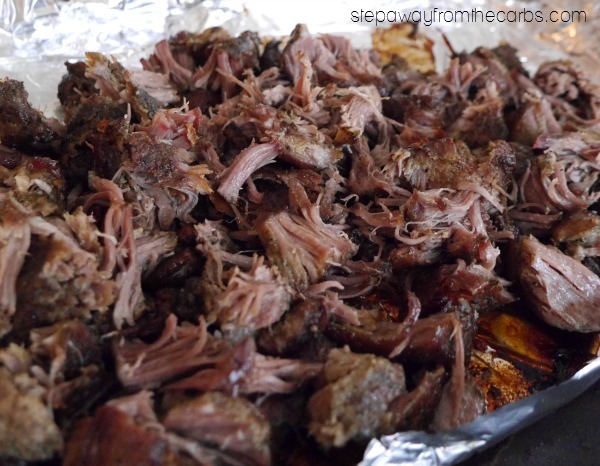 The Smithfield Marinated Boneless Pork Shoulder Seasoned Carnitas can be roasted in the oven or slow cooked – I chose to cook it in the oven in advance of preparing the taco bowls, so I could have everything ready when I came to assemble them. I cut the pork into smaller pieces to reduce cooking time, then wrapped it up a foil packet (no seasoning required – it has everything I needed right there in the marinade!). I roasted it at 350F until fork-tender. Then I used two forks to shred the pork into smaller pieces. 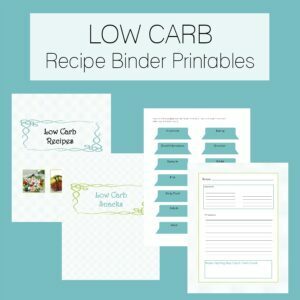 To make the low carb taco bowls, I used my favorite low carb tortillas, and used a 3″ cookie cutter to make 2-3 circles from each one. I pushed each circle into a mini muffin pan hole, and roasted them for 10-12 minutes in a 350F oven until they were crispy. Oh and don’t discard the left over pieces of tortilla – they are perfect for turning into homemade chips! 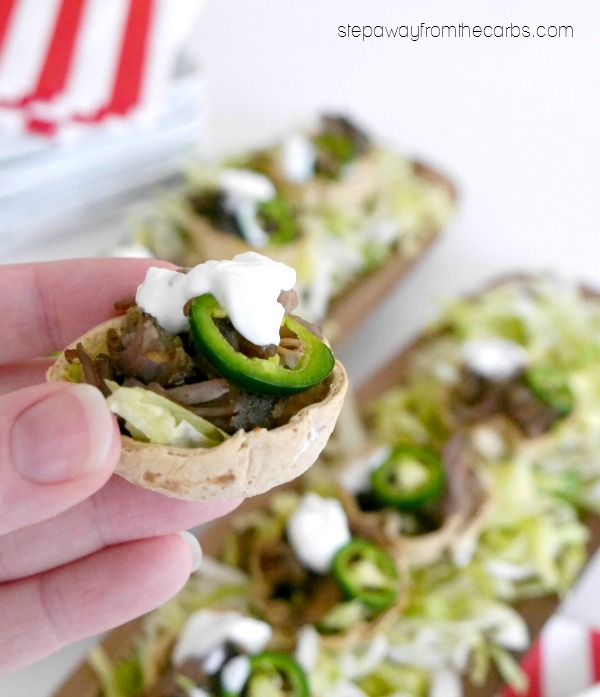 To assemble the taco bowls, I added some shredded lettuce to the base of each bowl, loaded it up with the cooked low carb pork carnitas, then topped it with a slice of fresh jalapeño and a tiny dot of sour cream. Other things you could add to your taco bowls include shredded cheese, guacamole (try my Easy Creamy Guacamole recipe! ), diced tomato or salsa. 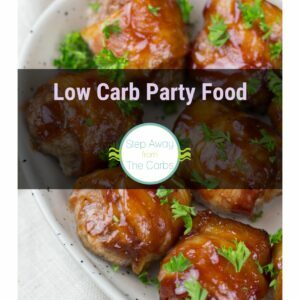 Cut the pork into smaller pieces and place it onto a baking tray covered with foil, then place foil over the top and pinch the edges to form a packet. Roast under tender, then use two forks to shred the pork. 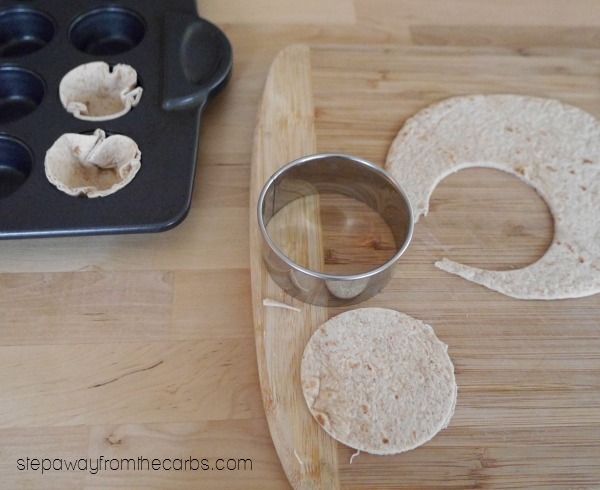 To make the low carb taco bowls, use a 3" cookie cutter to make 2-3 circles from each tortilla. Push each circle into a mini muffin pan hole, and roast them for 10-12 minutes in a 350F oven until they are crispy. 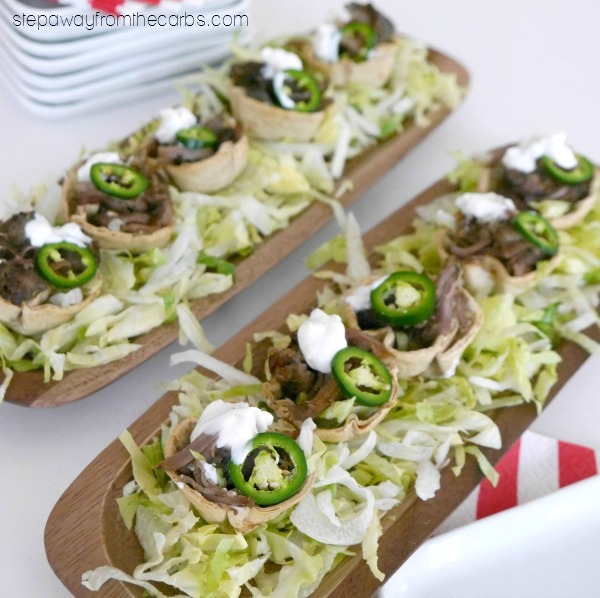 To assemble the taco bowls, add some shredded lettuce to the base of each bowl, load it up with the cooked pork carnitas, then top it with the jalapeño and sour cream. This recipe makes absolutely loads – to give you an idea, about half a pack of the pork will make about 25 mini taco bowls!! 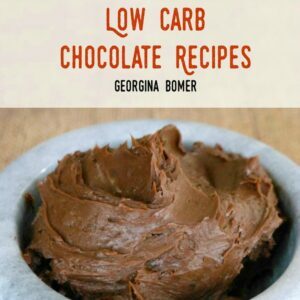 So you may not want to use all the pork for this recipe – but keep some for the next day. 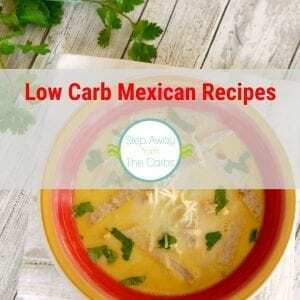 Serve it in a low carb wrap or over salad – it tastes great hot or cold! Get more information about Smithfield® by following them on Facebook, Twitter or Pinterest!